With the summer vacation season in full swing, many Pennsylvanians find themselves longing to be outside enjoying everything the state has to offer. Memories of summers gone by are vivid as we daydream about upcoming getaways – to the mountains or shore, to IronPigs or Phillies baseball games, to visit family and friends, or even as we look forward to weekend activities. Unfortunately, great memories and hopeful plans will be as far as some of us get. Feeling the hurt of high gas prices, unemployment, and the still-sluggish economy, many families have decided to scale down their summer vacation plans or opt for “stay-vacations.” But due to increasingly bad air quality and high gas prices, even our stay-vacations and local excursions may be sabotaged. The people of Pennsylvania have had enough of the dire consequences of our continued dependence on oil. We’ve had enough of the price spikes, the air pollution, the catastrophic oil spills, and the global warming pollution that threaten our economy, our environment and our public health. And now, our oil dependence is even jeopardizing something as basic as the ability to enjoy our outdoor resources this summer. Just two weeks ago, both South Mountain and Blue Mountain disappeared from sight on an Air Quality Action Day, blocked by a haze of ground-level ozone. 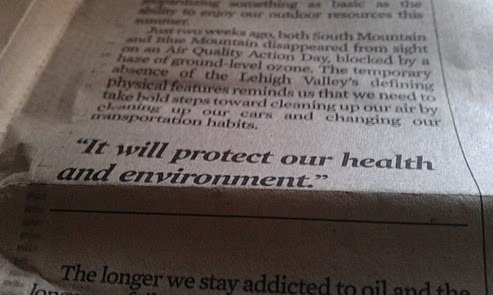 The temporary absence of the Lehigh Valley’s defining physical features reminds us that we need to take bold steps towards cleaning up our air by cleaning up our cars and changing our transportation habits. The longer we stay addicted to oil and the longer we fail to utilize opportunities offered by ride-sharing and transit, the worse these problems will get. The time has come to take bold national steps toward oil independence. Simply put, we can, and must, harness American ingenuity in the production of cars and trucks that will get us further on one gallon of gas. PennEnvironment recently released a report that found that the average Pennsylvania family could save $452 in one summer if our cars and trucks met a standard of 60 miles per gallon—a standard that the Department of Transportation and EPA have deemed within our reach by 2025. While Pennsylvanians are expected to spend more than $4.8 billion at the gas pump this summer, meeting a 60 mpg standard would save over half that, while reducing oil consumption by 600 million gallons and cutting dangerous carbon dioxide pollution by 6 million metric tons. We know that we can harness American ingenuity and use existing technology to make our cars and trucks much cleaner and more fuel efficient. Just this week, we were pleased to learn that higher demand for Mack’s line of near-zero emission trucks is expected to bring more jobs to the Lehigh Valley this summer. Additionally, over the next three years, more than a dozen electric vehicle models will be mass-produced in the United States. These new cars offer superior automotive performance while consuming no oil on most trips and producing no tailpipe pollution. And, these rides can be operated for less than three pennies per mile. Recognizing that we have the technology to break our oil dependence, the Obama administration set standards for new cars and trucks built between 2012 and 2016 that will save billions of gallons of fuel. This, too, was an excellent start, but more must be done. The standards the administration is now developing for cars sold between 2017 and 2025 offer an excellent opportunity to do just that. President Obama should move clean cars into the fast lane by issuing standards that ensure that the average new car and light truck meet a standard of 60 miles per gallon by 2025. He has every reason to do so—not only will it benefit Pennsylvanians at the pump, but it will protect our health and environment. Americans work hard and deserve stable access to affordable transportation and a healthy natural environment. The Obama administration should push ahead with clean car standards that will make these benefits a reality. We’ll all be richer, and breathe easier, for it. 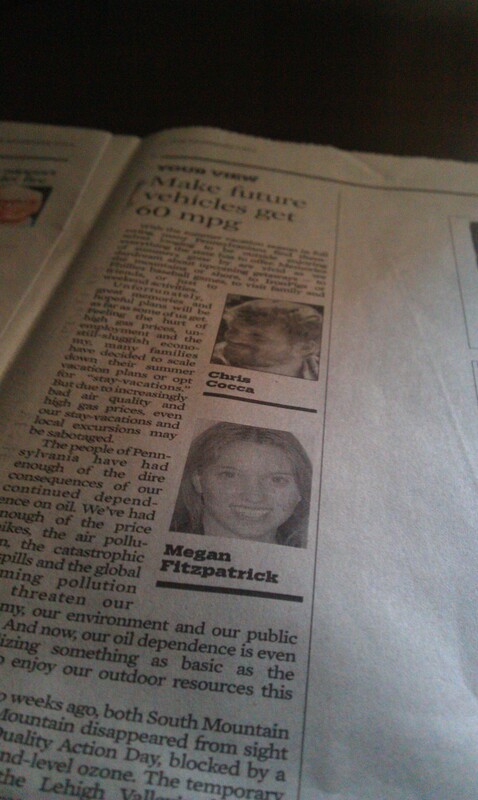 Megan Fitzpatrick is the Federal Field Associate with PennEnvironment, a citizen-based, non-profit environmental advocacy organization. Chris Cocca is the Outreach Director for the Air Quality Partnership of Lehigh Valley-Berks, a public/private coalition of volunteers dedicated to improving air quality in Lehigh, Northampton, and Berks Counties. Previous Post Is Google Rebranding or De-branding? “With the summer vacation season in full swing, many Pennsylvanians find themselves longing to be outside enjoying everything the STATE has to offer.” Don’t you mean Commonwealth? At one point, we had “Commonwealth” in the draft, for I am a stickler about that designation. Alas, it got changed along the way, probably for clarity. We did just have a royal wedding, after all.